It’s that time of year again — time for playing in the leaves, picking pumpkins at the pumpkin patch, carving pumpkins, going trick-or-treating, and of course eating lots of Halloween candy. My kids always get tons of candy when we go trick-or-treating. We end up with enough to last us for months! We normally don’t eat much candy, so it’s the one time of year that we allow ourselves to splurge! Earlier this month, Hershey’s wanted to help us get our candy-eating started, so they sent us a box full of Kit Kat bars and a bag of Reese’s Pieces to enjoy. Both products came with eye-catching Halloween packaging. The Kit Kat bars had unique messages inscribed in the chocolate, so it was neat to open them up and see what was inside. The Reese’s Pieces have always been a family favorite, so they were eaten up in no time! 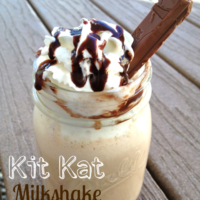 We had a lot of Kit Kat bars to eat, so I thought it would be fun to use some of them to create a yummy milkshake recipe. 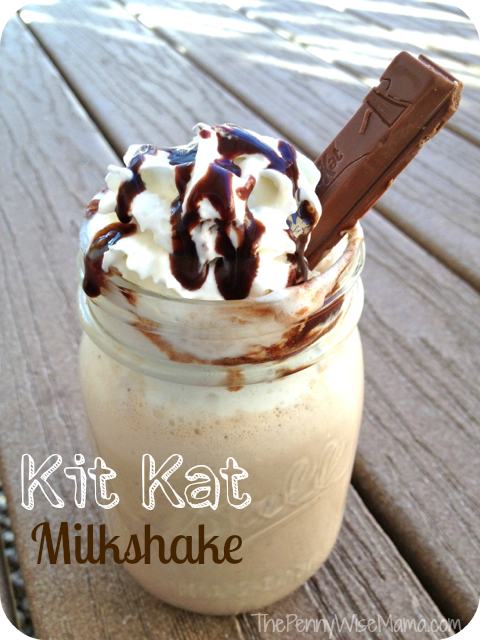 Our Kit Kat Milkshakes turned out so good and they were super easy to make! All you need is a Kit Kat bar , ice cream, milk, vanilla extract , chocolate syrup, whipped cream, and a blender and you can make your own in just a few minutes! 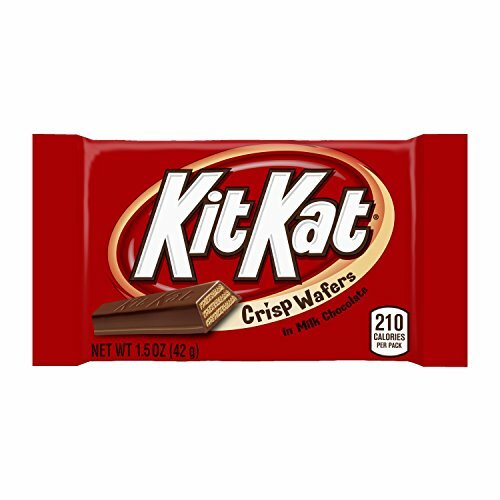 If you’re a huge Kit Kat fan, I would recommend buying them in bulk on Amazon. You can get a box of 36 for less than $20. I also recommend buying vanilla extract, like this one from Simply Organic. You’ll be surprised at how much better your milkshake tastes with real vanilla! Pour into your favorite glass and top with whipped cream and chocolate syrup. Enjoy! Instead of using a Kit Kat bar, use 1/2 c. of Reese's Pieces for a sweet peanut butter taste! Reese’s Peanut Butter Cups are my favorite. Reeses peanut butter cups are my favorite! I like them all. Kit Kat, Peanut Butter Cups, Mr. Goodbar, etc. I love plain Hershey’s chocolate bars! My favorite Hershey’s candy is Kit Kats. I love Reece’s Cups or the Special Dark Chocolate! yum this recipe looks delicious! Reeses are my all-time fav! Hershey’s dark chocolate with almonds is my favorite! Peanut butter cups are my favorite. I like the peppermint kisses they have at holiday time. By far, Reece’s peanut butter cups are my favorite. Love love Reese’s Peanut butter cups. Symphony bars are the best! My favorite is Kit Kat. York Peppermint Patties are my favorites. Reese’s peanut butter cups by a landslide. I like the hershey’s kisses with almonds! The blue Symphony bar with nuts! I love Hershey’s Hugs- the milk and white chocolate combination is delicious! I love Hershey’s Chocolate Bars with Almonds. I love Hershey’s Special Dark. Reese’s PB cups are my favorite. Hershey’s with almonds are my favorites! Reese’s for sure are my favorite! I like Reese’s Peanut Butter Cups! It’s a toss up between PB cups and Kit Kat. I love, Love, LOVE Reese’s Pieces!!! My favorite is the regular hershey bars! The plain milk chocolate bar. I do love Cookies and Cream too. I toured the Hershey factory once, that was fun! I love Reese’s Peanut Butter Cups! Special Dark is my Hershey’s of choice! Hershey Milk Chocolate with almonds, or Mr. Goodbar! My favorite is a Hershey Bar with Almonds. kitkats are my all-time fav! Special Dark Hershey’s and Kit Kats! It has been between 2 for a long time either the regular Hershey Bar or Kit Kat my new favorite is a white chocolate kit kat now! Now I want to go buy ice cream & kit kats! lol 🙂 Can’t wait to try this with the family! ..This. I am trying this. These are my favorite chocolate candy! I want to make this now! Can’t wait to try it! Yum! My GF will love this! this is so great! I love kit kat!! Wow this looks so scrumptious! 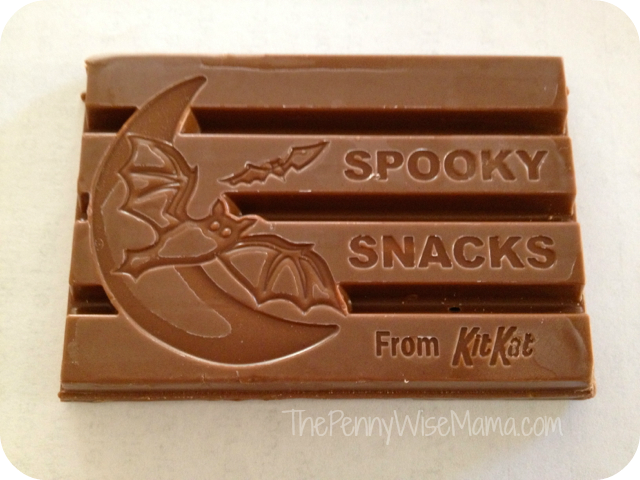 We love kit kat this would be so perfect to serve for dessert tonight or anytime. Thank you for sharing the recipe. This looks so amazing! gotta try it soon! That looks delicious! I think I would make it with peanut butter cups! Kit Kats and Reese’s Pieces – 2 candies that everybody loves, and what a great idea to use them to make milkshakes. If I had to choose one for the milkshakes, I would choose Kit Kats because of the wonderful texture. When you say ‘1 Kit Kat bar’, is that the four sticks that make up one bar or just one stick? Hi Rebecca, you use all four sticks. Thank you!